Do You Know that you can search just the Business pages of the site by using the Business button in the Partitioned search engine at the bottom of the Current What's New Page? You will also find extensive business information in the Directory section. Joyce - this is a POST CARD I found among my Grandfather's things at my Aunt's house in Sanitaria Springs, N.Y. He was Theodore Roosevelt Myers and he was born in 1903 in Eldredsville, Sullivan County but moved at some point to New Albany, Bradford, PA. Both of my Gr Grandparents are buried in the Hillcrest, New Albany Cemetery in New Albany, Pa. Peter Nathaniel Myers and Lucy Emma Sturdevant Lee Myers - He was her second husband. Anyway this post card is of my Great Grandfather, Peter N. Myers. On the back it has the usual post card info with a place for a stamp and the hand written notation: "Peter Myers with a load of 'crokinole' boards". They look like game boards or game-table tops to me. Maybe someone knows what they are. I know the features are very small but he is looking at the photographer and it is definitely him - he has his big mustache as those of us n the family have seen before. 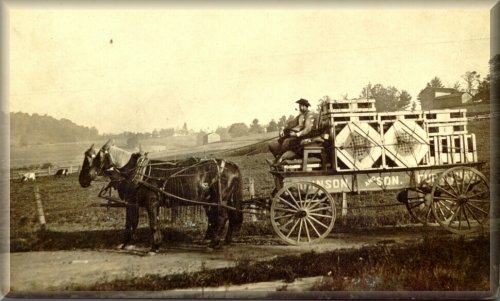 What a great image of him driving a team with the Munson and Son Furniture wagon!. Please place it in your photos section. Anyone may use it. Crokinole is a game board that has two sides. One side is for checkers, which is what looks like the picture shows. 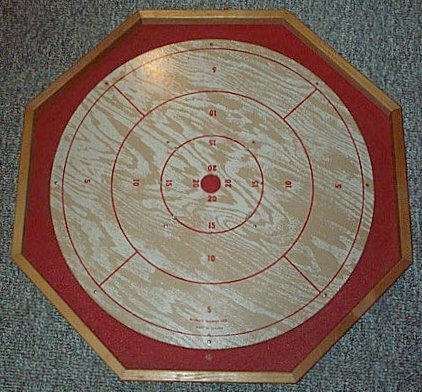 The other side was for crokinole where you shot crokinoles into the center of the board eliminating your opponents crokinole and gaining points in the mean time. We still play crokinole at family get togethers, and I have two boards. There are at least 28 pieces, two different colors. It is a family game that we have played for years. 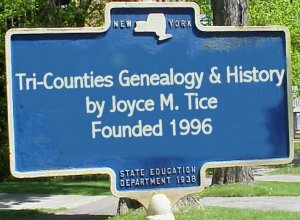 Dear Joyce, I remember learning to spell it back in the 1930's--- the board we had spelled it croquinole and I had a hard time getting it right. As I recall, it was related to checkers but guess it got left behind somewhere. My dictionary doesn't have it in either spelling. Bet your parents will remember it ! Melva C.
I see that "crokinole" is a board game - apparently still made by the Pichenotte Game Board Company. Yes crokinole is a board game of years gone by. I remember playing this game when I was a kid with my grandfather every time I visited him. I purchased an original board at a flea market a couple years ago, but unfortunately the game disks were not included. There is a place I believe in Ohio that refurbishes the boards and also sells replacement game disks. The object of the game was to get your disks closest to the center of the board. You were also trying to knock your opponent away. When I was a kid at home, we had a crokinole game. The board is probably about 2 1/2 to 3 foot square. It had pockets in all four corners (holes cut with net type baskets). The game pieces were round wooden disks with the centers cut out. They were probably about and inch across and 1/2 an inch high. They were green and red. The shooters were white and you snapped the shooter with your finger to try to knock your color disks in the holes. The first one to get all their disks in the holes won. You took turns shooting. If you got one in, you got another turn. The squares on the board were so that you could use the same pieces to play checkers. The board we had is probably still at my mothers. It was a fun game, but you had to have tough fingernails or it hurt like crazy when you snapped them. Now that you have described the board Elaine, I was playing that game last night at Family Night at the Shortsville Baptist Church. It reminded me a lot like pool except you snapped the white rings with your fingers. And you are right, it does hurt if you don't really know how to snap right. excited as no one else seeems to remember this game but her! The crokinole board often has multiple games on it. In the one shown on Joyce's website checkers and backgammon are on one side and crokinole is on the other. The same setup is true of carom boards. Caroms is similar to crokinole but not the same. Many of us who grew up in the fifties and sixties are more familiar with the inexpensive mass-produced carom boards. Many of the boards came with miniature pool cues. Using the cues to shoot caroms was much easier on the fingernails. I am sending Joyce a picture of a carom board. Ray Justus. I'm going to type out an article from the Rocket-Courier regarding crokinole boards. I tried to scan and send it that way, but due to my copy being in blue ink, I had to cancel the e-mail after 10 minutes. It was just going to take too long to send. I think Bradford County Historical Society has this newspaper on microfilm - next time I go there I will try to get a copy for you. This Photo dates back to 1908 and shows Peter N. Myers, of LeRaysville, driving this team and wagon on the creamery hill near LeRaysville. The teamster was driving for the Arthur Johnson and Son Furniture Company, then located and flourishing in LeRaysville. One popular item made by the company, and sold by the thousands, were crokinole boards. 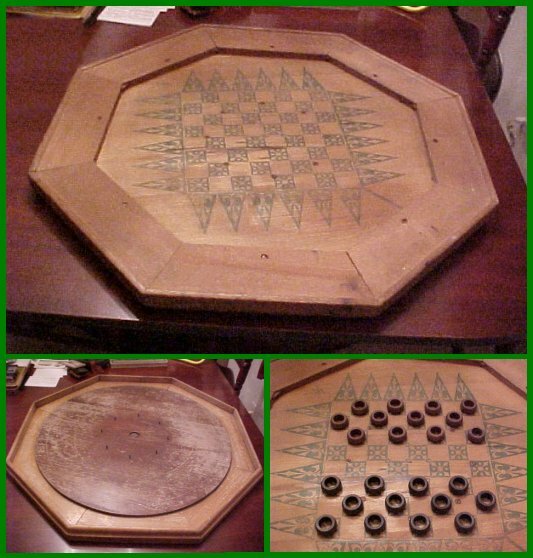 These game boards were made to play crokinole on one side and checkers on the other. The checkered side in this picture, exposed to the outside of the packing cases and no doubt considered the less valuable of the two game-board sides. In the background can be seen some Holstein cows grazing and a split log fence made from the original hemlock forests found in the area when the land was originally cleared some 100 years previous to this photo. The photo is loaned by Mrs. Elizabeth Tuthill, R. D. 1, Rome, PA, and was originally published on a postal card. The photo at left is of a Crakinole Board on sale at ebay while we were discussing this issue. I believe the board below represents the correct side of the board for this game. The board at right is the Carom board photo sent in by Ray Justus - See note above. I'm sure you are unaware of our organization so I would like to introduce you to the World Crokinole Championship which is held in Tavistock, Ontario, Canada the first Saturday in June each year. June 1, 2002 will mark our fourth annual event with over 350 participants at our 2001 tournament. The Lagasse Brothers of the Pichenotte Game Board Co. were involved with our tournament the first year and are friends of the tournament organizers. They made us aware of your site. Please go to www.worldcrokinole.com to view our site. I am writing to ask if we may put a link to your site on our history page so that others can read about this postcard's history. There may be more photos out there that can be shared. P.S. Like you, we are a group of volunteers in our community. My name is Wayne Kelly. I wrote a book on crokinole back in 1988, and am writing a new one at the moment. item Model # CW-3 manufactured in 1958 (likely; although I'd have to see reverse side to date with certainty). The last one is a square Carrom Company, Ludington, MI board, likely Model # 85, c.1960. My friends, Dave & Norm Lagasse (Santa Fe - Pichenotte Game Board Company) forwarded the picture & info. to me. Just a further thought on the Carrom Company. My close friend, Brian Lonsway (Ohio) is presently writing a history of that company with many details on American crokinole. Hoping it will be out next spring. We worked together on the project just a couple of weeks ago. Think there are several LeRaysville boards in his collection at the moment. all over the world. More on that later, if it is of interest to you. Get back to me if I may offer more assistance. By the way, I just went back and read all of the posting on the Crokinole Board game and the photo of my Great Grandfather, Peter Nathaniel Myers - my dad's grandfather, whom he never knew. Peter Myers died in 1920. Mrs. Elizabeth Tuthill, as mentioned by Carolyn Russell was my father's Aunt. We called her Aunt Libby. I will never forget her, she was a wonderful older lady when I knew her, during the 1960's and 1970's. In fact I was given her portable 78, wind-up record player by one of dad's cousins. This cousin also sent me an original copy of the Rocket-Courier article since the photo was of her grandfather too. Anyway what a great job you have continued to do with your site. It is really awesome - the best on the net.